We all owe our childhoods to wonderful books that populated our imagination and powered our curiosity. And these 12 book libraries have everything that a child could ask for — tons of books, lovely reading corners and even eats and treats to go with the literary adventures. So pick up a book library membership today for your kids and you’ll soon find yourself wishing you were a child again! Can’t have enough of libraries for the little tykes, then find some more here. From short stories and picture books to mythology and self-help books for kids, Easylib boasts of some fantastic categories for children. Their catalogue is very comprehensive and ideal for kids of all ages. In fact, we’d love to curl into their reading corner ourselves! There are many things that make The Reading Room unique. Its librarian, Falak Randerian, is something of an early reader whisperer, who can handpick exactly the kind of books that each child will love. It also has phonics classes and book clubs, so reading is approached in a holistic way with both independent and shared reading experiences. If your little one is under 12, this one’s for you. Want a library that stocks books not only in English but also in the regional languages? 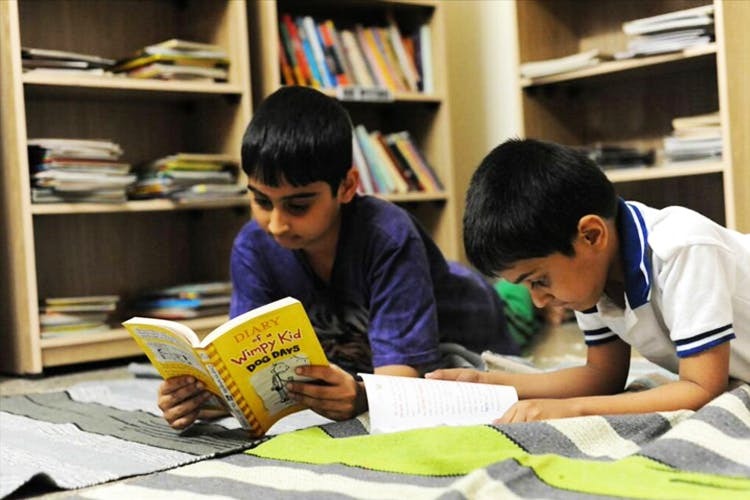 NOOL library has centres across Bangalore and has books for both adults and children with about 25,000 plus books. It has a lovely collection of children’s books, bestsellers, board books, fiction as well as non-fiction from various publications. MyMitra children’s library in Jayanagar is literally a child’s friend stocking a variety of books for kids across all age groups. You have a range of books for toddlers, beginners, pre-teens, and teens. It also stocks good fiction and non-fiction books for adults. You can also find books on self-help, bilingual, and Kannada books. Look out for their multilingual tomes and handpicked children’s books in almost every category, apart from books for adults as well. Located in Bellandur, ReadNGrow Kids’Library is packed with books for children and also conducts storytelling sessions and after-school activities. With affordable membership plans, it also brings together children’s authors and storytellers for different events. The best part of Discover Kids is that it is a complete reading experience. With books, games and CDs to a play area where children can socialize and free Wi-Fi that helps children research and learn interesting things about the books they are reading, Discover Kids is a fun-filled library and one of the oldest children’s libraries in the city. Apart from the tons of beautiful titles for children and teenagers, KydzAdda library also boasts of a cafeteria and plenty of reading space for the kids. Perfect for kids between 1 and 13 years. One of the oldest libraries in the city, Eloor has been around for more than 34 years and has one of the finest collection of books in the city. It is known for its eclectic range of literature and magazines across all categories, for both children and adults. If you would you like to get personalised book recommendations for your child, look no further. InferAlpha library stocks books for children between 0-10 yrs of age. From classics to folktales, they have it all, including books in Kannada. If a book is unavailable, they go out of their way to source it for you. And the best part? They are actually an online service who’ll deliver your stash of books to your home.